Pacific Gas and Electric Company (PG&E) successfully completed the hydrostatic pressure testing of the Santa Cruz, Calif. region’s main natural gas transmission pipeline, according to the company. During the test period, the natural gas transmission pipeline was taken out of service. This meant that the gas couldn’t be distributed to customers via the traditional method, through the pipeline system. 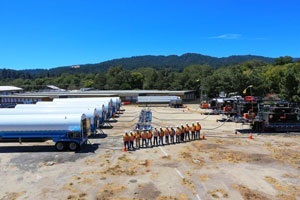 In order to provide uninterrupted service during the several weeks it took to complete the testing, PG&E used trailers to deliver liquefied natural gas (LNG) and compressed natural gas (CNG) to the injection sites. PG&E’s drivers made constant LNG/CNG deliveries to injection sites in the region and by the end of it, the drivers traveled a total of 119,700 miles. Photo courtesy of PGE Currents. The drivers and loaders operated five portable compressors, 32 tankers, and three vaporizers, according to the company. It took a team of 89 people, consisting of technicians, supervisors, support personnel, and drivers and loaders to complete the project. The drivers and loaders operated five portable compressors, 32 tankers, and three vaporizers, according to the company. PG&E has been using portable natural gas equipment since 1998, and was first conceptualized to provide temporary support during peak winter demand. In more recent years, the utility uses portable equipment, which has advanced over the years, during planned or emergency outages.